Teachers who work with young children will agree with me that keeping kids engaged for a long time is a difficult task. In order to keep their focus and to ensure that they are learning we need to divide their time into a variety of smaller activities – telling stories or taking them for walks or using puppets, plays, songs, dance, games, etc., are some ways in which we can keep them productively engaged. In this article, I would like to share with you a few games that can be played using dice to help teach different concepts in language and science. The games mentioned here require minimal resources – some dice, chart paper, glazed/colour paper and colour pens/pencils. You can use a craft activity class to prepare the dice and the cards to play these games. You could also buy the dice as they are easily available in the market. Buy a variety of sizes and use them depending on the age group you are handling. If the dice is big or the game requires that the children roll more than one dice at a time use a box or wide mouthed bottle to shake and roll out the dice. These games can be used in any language class – English or any regional language. Select any six letters of the alphabet and write them down on pieces of paper and stick these on each side of the dice. Give children the alphabet dice. Ask a child to roll the dice and recognize the letter on the dice. Every child can take turns this way to play the game. 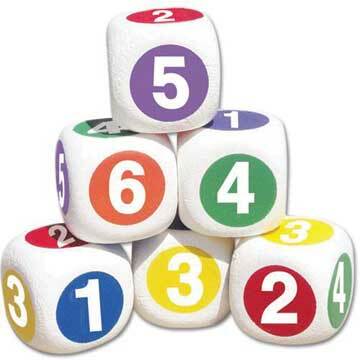 Introduce six new letters once you realize that all children a familiar with the letters on the dice.